Award-winning filmmaker, lawyer, and born storyteller, Kalyanee Mam, is committed to combining her passion for art and advocacy to tell compelling and universal stories. Born in Battambang, Cambodia during the Khmer Rouge Regime, she and her family fled the refugee camps at the Thai-Cambodian border and eventually immigrated to the United States in 1981. Even to this day her mother recounts stories of their flight through jungles laden with land mines. These stories and many others inspired Kalyanee to return to her native homeland and to make films about atrocities occurring in Cambodia even today. Most recently, Kalyanee has directed, produced and shot winner of the World Cinema Grand Jury Prize: Documentary at the 2013 Sundance Film Festival,A River Changes Course, which charts the radical changes in Cambodia today that are transforming not only the country’s landscape – but also the dreams of its people. Kalyanee has also worked on 2011 Oscar-winning documentary, Inside Job (Cinematographer, Associate Producer, and Researcher) about the global financial crisis and documentary short Between Earth & Sky (Director, Producer, Cinematographer) about three young Iraqi refugee artists living in Syria, Jordan, and Egypt. A graduate of Yale University and UCLA Law School, Kalyanee has also worked as a legal consultant in Mozambique and Iraq. San Francisco writer/director/editor Chris Brown has been making award-winning films for over a decade. His latest feature, Fanny, Annie & Danny (2010), has won 16 awards internationally. Hailed as “An indie masterpiece” by THE HUFFINGTON POST, Fanny, Annie & Danny was recently named a “Critics’ Pick” by THE NEW YORK TIMES. Brown’s previous films include Daughters (“Something as genuinely unpretentious as Chris Brown’s debut feature seems an anomaly.” – VARIETY), Scared New World (“Solidly in the tradition of pioneer indie pics like Cassavetes’ ‘Shadows. '” – VARIETY), Battleship Contempkin (“Gorgeous…you should check this film out if at all possible.” – FILM THREAT), Lost Cat (“Defies categorization…hilarious.” – SF CHRONICLE), Office Furniture, and the 2011 Bay Area Emmy award-winning documentary,The Next Frontier. By night, Chris is a singer/songwriter whose music has been heard on NPR, ABC and HBO. His debut album, Now That You’re Fed was voted “One of the Top 10 albums of 2006” by a dozen music critics. Ratanak Leng is a full-time staff member and Team Leader of the Film Project at The Documentation Center of Cambodia (DC-Cam). He has directed and produced two documentary films – Victim Participation Through Filing Complaints to the ECCC and Living Documents. 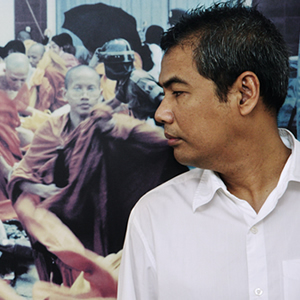 Ratanak served as Assistant Producer for the documentary film, Behind the Wall of S-21: Oral History from Toul Sleng Prison and Research Assistant for the documentary short, The Conscience of Nhem En, which was shortlisted for the 2011 Academy Award for best short documentary film. Ratanak received a Bachelor’s Degree of Arts in Media Management from the Royal University of Phnom Penh, a Bachelor of Education in English from Norton University in Phnom Penh, and is now working towards a master’s degree in the field of Peace and Politics at Kyung Hee University in South Korea. David Mendez is noted for creating electronic musical textures combined with live acoustic instruments to create ambient and melodic music. A guitarist of 21 years, David studied music at San Diego State University and is accomplished in various musical genres including classical, rock, jazz, blues and electronic music. In the past he has played in a few bands – but these days he prefers to write and record his own music in his home studio in Sonoma County. David has worked as a composer and recording engineer. Other original scores by David include the films, The Greater Meaning of Water (Sky Christopherson), My Brother’s Arms (Mark Barnet), Mojado (Angela Trevino), as well as his own documentary short Between Earth & Sky (co-dir Kalyanee Mam). David has also worked as a location sound mixer for Oscar-winning documentary Inside Job (dir. Charles Ferguson). Youk Chhang is the Executive Director of the Documentation Center of Cambodia (DC-Cam) and a genocide survivor of the Khmer Rouge’s “killing fields.” He became DC-Cam’s leader in 1995, when the Center was founded as a field office of Yale University’s Cambodian Genocide Program to conduct research, training and documentation relating to the Khmer Rouge regime. Youk continued to run the Center after its inception as an independent Cambodian NGO in 1997 and is currently building on DC-Cam’s work to establish the Sleuk Rith Institute, a permanent hub for genocide studies in Asia, based in Phnom Penh. Youk is a Senior Research Fellow at the Center for the Study of Genocide, Conflict Resolution, and Human Rights at Rutgers University-Newark. He is also the co-editor ofCambodia’s Hidden Scars: Trauma Psychology in the Wake of the Khmer Rouge (2011) and the author of multiple articles and book chapters on Cambodia’s quest for memory and justice. Youk received the Truman-Reagan Freedom Award from the Victims of Communism Memorial Foundation in Washington, DC in 2000. He was also named one of TIME magazine’s “60 Asian heroes” in 2006 and one of the “Time 100” most influential people in the world in 2007 for his stand against impunity in Cambodia and elsewhere.